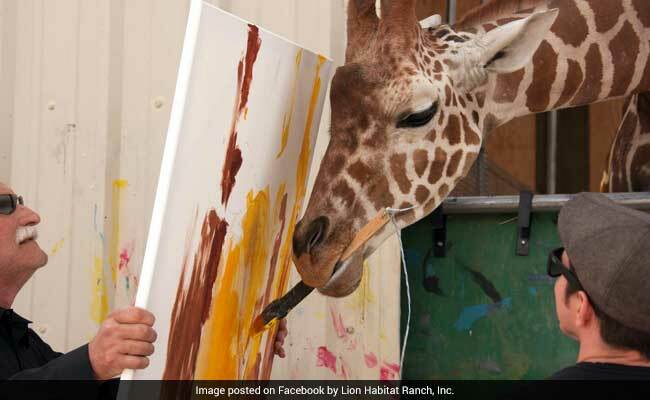 This Giraffe Prodigy Paints At A Lion Sanctuary. Would You Buy His Art? The paintings consist of a disorganized conglomeration of colorful lines. 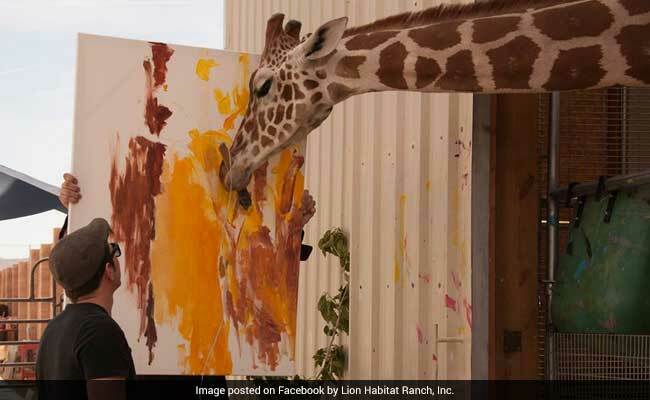 Las Vegas: Few giraffes have the talent that Ozzie was born with - the three-year-old giraffe paints at a lion sanctuary in Nevada and his work is selling reasonably well. Standing almost four meters (13 feet) tall and weighing 635 kg, Ozzie surprises visitors to the Lion Habitat Ranch in Henderson, 25 km southeast of Las Vegas, with his colourful pictures, reports Efe. "Ozzie likes to paint. If he didn't he wouldn't do it because we have no way to force him," Keith Evans, President and owner of the lion preserve measuring 34,000 square meters with its 36 lions, dozens of birds and house artist Ozzie, told EFE. The animals there are accustomed to living peacefully together. Neither the lions' roars nor children on field trips bother Ozzie while he paints. In his habitat, surrounded by a fence where the curious station themselves, Ozzie moves around with a brush in his mouth, calmly using it to paint on various canvases that will be fastened to the fence for others to admire. The paintings consist of a disorganized conglomeration of colorful lines - some might call it "abstract art" at its finest - and each one is about 20x25 cm (8x10 inches) and sells for $40, although larger ones measuring 40x50 cm fetch up to $300. Ozzie eats up to 20 kg of vegetables each day, snacking on Brussels sprouts and chunks of cauliflower in exchange for returning the paintbrush to his caretaker after each artistic foray. Ozzie arrived at the lion sanctuary when he was eight months old. Since then he has been honing his talents, says Evans, whose lion preserve is visited by an average of 3,000 people each month. He says the giraffe "works" on his paintings during three sessions each day, painting a maximum of two works per session, and he doesn't mind having his picture taken with his fans. The artwork is sold at the ranch's store, along with other items such as T-shirts, hats and scarves.